Ralph Macchio, Joe Seneca, Jami Gertz, Joe Morton, Robert Judd, Steve Vai, Dennis Lipscomb, Harry Carey Jr.
An affectionate tribute to the Blues, Crossroads stars Ralph Macchio as a musical prodigy and Julliard scholar whose passion is the Mississippi Blues and whose mission it is to track down a forgotten song written 50 years before by his hero Robert Johnson (Tom Russ). When I reviewed Steve Vai’s Live at the Astoria London, I mentioned my history with the 1986 movie Crossroads. 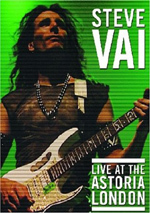 Vai appears in this flick as a slick guitar player - talk about typecasting! - and since a couple of my college roommates adored his work, I got stuck watching this movie more times than I can count. We checked out Vai’s part of the film at least 100 times over the years, and I must have seen the whole picture no fewer that 15 times. 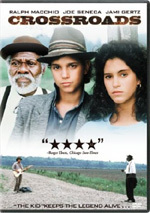 In Crossroads, young guitarist Eugene Martone (Ralph Macchio) obsesses over the blues. He goes to a local rest home in which blues legend Willie Brown (Joe Seneca) resides but can’t get past the security. To circumvent this, he gets a job as a janitor there, but when he meets his idol, Willie denies that he’s the right guy. Eugene studies classical guitar at Juilliard, a place that frowns on his fascination with the blues. He receives a reprimand from his instructor who feels Eugene wastes his talent on “primitive” music. Eugene continues to work at the rest home, where he tells Willie he wants to find a legendary missing Robert Johnson tune. He thinks Willie can help him locate the number, but the old man again laughs at him. Eugene persists and sparks some memories when he shows Willie an old photo. We see a flashback in which Willie sold his soul to the devil to gain talent as a bluesman. When Eugene plays guitar for Willie, the old man finally acknowledges his identity and the boy’s talent. However, Willie slams Eugene due to his lack of “mileage” and won’t let him have the missing Johnson tune unless the kid busts him out of the rest home and takes him home to Mississippi. Reluctantly, Eugene agrees to Willie’s deal. They flee the rest home and hop a Greyhound to Memphis, which is how far Eugene’s money will take them. They’ll change buses there and Willie claims he’ll pick up the tab from there. On the way, Willie tells Eugene he sold his soul at the crossroads. Inevitably, once they get to Memphis, it turns out Willie exaggerated about his wealth. They need to go 200 miles to Mississippi without the funds, so Willie proposes they hobo their way to his home. They get to know each other and Willie starts to influence Eugene’s musical way, especially when he pushes the boy to go electric. Along the way, they encounter another hobo named Frances (Jami Gertz), a feisty runaway who claims to have a dancing gig in LA. Willie thinks that she’ll help them get rides, so they hook up despite her disinterest. Eventually they “borrow” a car from a sleazebag and all drive south. The rest of the film follows their journey as they get to know each other and their stories, all of which culminates in a fight for Willie’s soul. As I alluded at the start, I can’t really view Crossroads objectively. It long ago became too ingrained in my past for me to see it on its own. I can try, though, and through the prism of attempted objectivity, I can say… it’s okay. Actually, there’s not a whole lot to the movie. I suppose one could look at it as a coming of age tale, for it takes Eugene from his sheltered existence to come into contact with a grittier side of life. But does he really grow from start to finish? Not particularly; Eugene seems more spontaneous by the end and he develops some humility, but I don’t think he demonstrates any other notable changes. Frances exists as little more than a plot point; her character development comes across as stilted and forced. Only Willie seems like anything more than a one-dimensional personality, although even he doesn’t present great breadth. Still, we sense a history and life with him, whereas the others feel like generic personalities. Much of the credit goes to Seneca’s talents, for he brings much more substantial depth to Willie than the personality deserves as written. Seneca delivers a crusty, unsentimental performance that makes Willie memorable and lively. He also shows the character’s vulnerability via small bits like the heartbreaking way he hangs his head when he thinks his case is lost. In a lot of ways, the main plot to Crossroads feels like little more than foreplay to get us to the climax. That’s where we finally see Jack Butler played by Vai, the main attraction for many viewers. There’s no way to prove this, but I’d bet the majority of the current audience for Crossroads comes from Vai partisans, and his scenes continue to entertain. The man couldn’t act, and there’s no sillier moment in movie history than the sight of Vai attempting to look nervous. Nonetheless, the guitar duel delivers the goods for those who love his work, and I expect that once my friends get their copies of the DVD, they’ll put the duel on repeat endlessly. I enjoyed watching Crossroads for the first time in about 15 years, but I can’t say it offers much of a movie. It seems entertaining enough and presents nice guitar work. Otherwise, the film has little reason to stand out from the crowd. Footnote: the climactic duel - and Vai’s relentless emoting - becomes more entertaining when you know that Steve played the parts for both the Butler and Eugene characters. This doesn’t hold true for the whole scene but just for the classical-influenced bit. 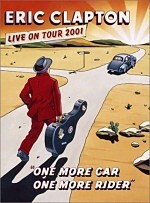 Crossroads appears in an aspect ratio of approximately 1.85:1 on this single-sided, single-layered DVD; the image has been enhanced for 16X9 televisions. The film looked generally good but suffered from some problems typical of movies from the era. Sharpness usually seemed acceptably crisp and well-defined, though a bit of haziness occurred as well. A few shots were softer than I’d expect. Nonetheless, the movie usually seemed accurately detailed. Moiré effects and jagged edges provided no concerns, but I saw a mild to moderate edge enhancement in parts of the movie. Print flaws remained pretty modest, though. The movie seemed somewhat grainy, but otherwise only an occasional speck or blotch popped up during this surprisingly clean flick. On most occasions, I thought colors appeared acceptably bright and accurate, usually during exteriors, but these weren’t consistent. At times the hues came across as flat and without much life. That seemed typical of Eighties flicks, and Crossroads remained decent to above average in regard to its color reproduction given its era. Black levels were a bit drab at times, but they usually appeared acceptably rich, and low-light shots were fairly concise and well developed. Though inconsistent, Crossroads presented a generally positive impression. As for the movie’s Dolby Surround 2.0 soundtrack, it was also pretty good for its era. This mix remained oriented toward the front spectrum. The forward channels displayed acceptable spread from music and some effects and the audio blended together fairly well. General ambience dominated, though it managed to provide some nice panning and development at times. Music also offered nice stereo delineation. Surround usage seemed minimal, with mostly only mild music or environmental material coming from the back during parts of the movie. For example, bar sequences brought the surrounds to life pretty well, as did Willie’s nightmares. Throughout the majority of the movie, though, the rear speakers seemed fairly uninvolved. Audio quality was decent to good. Dialogue usually came across as distinct and easily intelligible with no signs of edginess. Effects were clean and decently realistic. Louder sequences presented lively sound with good dynamics and definition. The most important aspect of the track, music was inconsistent. The score seemed acceptably defined most of the time, but it generally lacked much force or range. Live music segments at bars were boomy and demonstrated too much reverb. This made the climactic guitar duel sound less powerful than I’d like. The guitars were acceptably well defined but the whole thing seemed a bit muddy and without the dynamics I’d expect. Crossroads remained a fairly nice track for 1986 but not anything better than that. Unfortunately, Crossroads comes with virtually no supplements. We only get a Previews area with ads for You Got Served, The Karate Kid and Silverado. As a reminder of my younger years, I found it fun to watch Crossroads. However, the movie doesn’t do much for me in a more objective sense. It presents a moderately intriguing tale with some lively guitar playing and that’s about it. The DVD offers relatively positive picture and sound but includes no real extras. Die-hard Steve Vai fans like my friends will still love it, but I find it tough to recommend this average movie to others.